Occasionally, some lacquered brass instruments develop small brown spots or areas of discoloration. 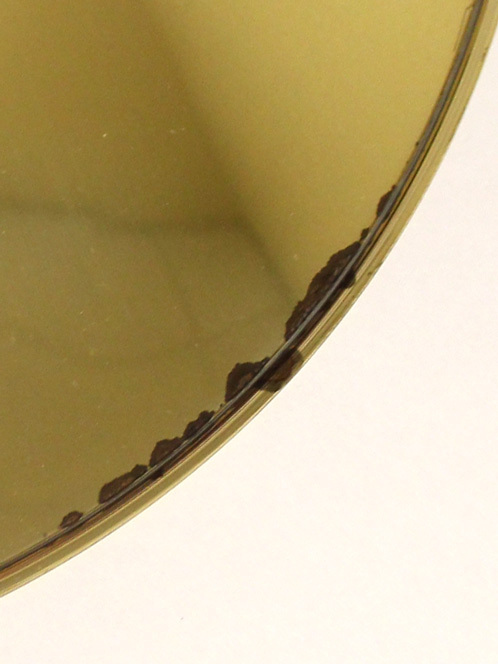 Brown spots are copper oxides formed when moisture is trapped under the lacquer during the lacquering process. Before an instrument can be lacquered it must be perfectly clean and free of any oils or greases. One drop of oil can spread out to cover about seven square feet, so it doesn’t take much to ruin a lacquer job. In times past, instruments were commonly degreased with trichlorethylene or 1,1,1-Trichloroethane, either by dipping or by spraying with vapor. These chemicals, while very effective solvents, are toxic and carcinogenic and deplete the ozone layer, so they have been phased out of use. Their replacements, water based detergent cleaning systems, can leave moisture behind. Typically, brown spots appear in small fissures in the solder at ferrules or along the bell rim where moisture has been trapped. Brown spots are purely cosmetic. They’re superficial and don’t cause any damage to the instrument. Don’t confuse them with pink spots. Pink spots are caused by the acidic components of the breath, which attack the brass alloy, eating away the zinc from the inside and leaving behind a pin hole all the way through the tube. Pink spots usually occur on the mouthpipe, slide bows, or trombone outer slide tubes and indicate a serious deterioration of the instrument. When you see a brown spot, scrape it with a pin to open up the lacquer and allow the moisture to escape. It’s a good idea to scribe all the way around the rim to prevent future problems. You can use a non-abrasive polish like Simichrome to brighten the metal and then seal it with a drop of clear nail polish. Larger areas can be buffed and relacquered. Someday, maybe someone will figure out how to prevent brown spots. Till then, the best approach is to go after them early to keep them from spreading.